Starting the episode at a challenge! What sorcery is this? It’s a tribe shuffle, of course, and most of the main alliances we’ve been following for the first three episodes are now broken up and scattered throughout the three new tribes. This should be interesting. “It looked like a big chip, I almost ate it,” said Jessica, as the editors cut to shot of the secret advantage that looks nothing like a chip. Jessica’s advantage is that she can block another player’s vote at the next Tribal. Cole’s idea is to make everyone think he’s trustworthy by telling them about Jessica’s secret advantage. I’m not sure Cole thought this strategy all the way through, especially when he totally gets busted by Lauren later in the episode and is forced to admit to Jessica that he told. It’s especially dumb that Cole did this because his group has a numbers advantage on their tribe, as long as no one rocks the boat. Which Cole immediately did, for no good strategic reason. Jessica, you kissed the cheek of a dummy. 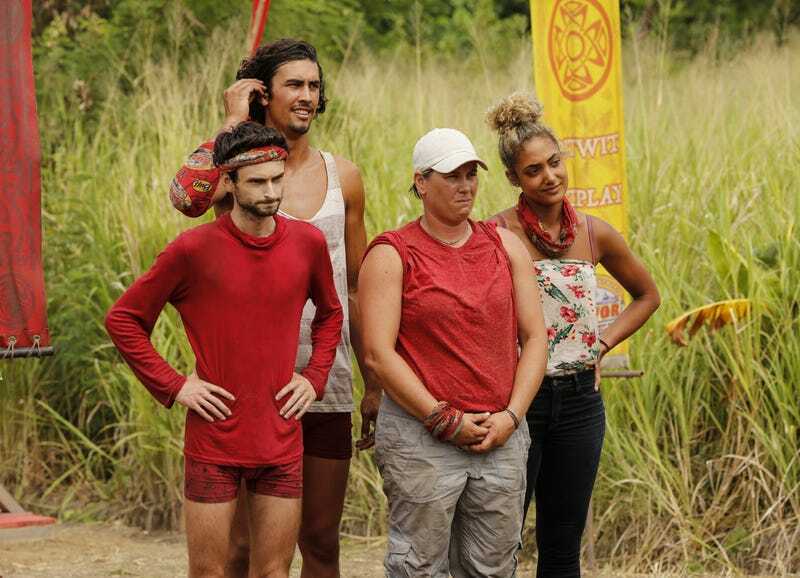 One fun thing about the tribe shuffle: Ryan gets to tell Chrissy that he was the person who gave her the advantage in week one. Interestingly, the tribe full of “great competitors” came in last in both challenges in this episode. 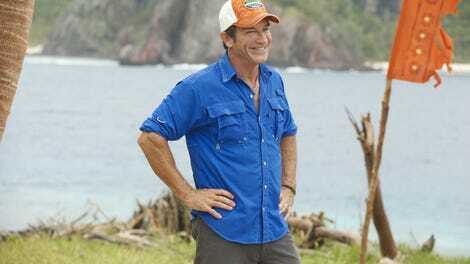 Almost like being young and strong isn’t the only positive attribute a Survivor player can have! Joe decides that he has to play his idol and therefore he doesn’t want to waste it, so he wants to make sure the other side all votes for him instead of Desi so his idol isn’t wasted. This is the kind of diabolical, complicated plan I can get behind. This strategy does one sure thing: make Desi cry and ask Joe to use the idol on her instead. Don’t make Desi cry, Joe, but also don’t use the idol on her. Jessica sticks Devon with the secret (dis)advantage and takes away his vote, and with the tribe split right down the middle it means he has no potential to swing the vote either way. His “that is not an advantage” is perfectly delivered. With Devon not allowed to vote, Joe’s diabolical plan ends up working: Ashley and Alan vote for Joe, his votes are tossed out, and Alan goes home instead with two votes. The shocked look on Ashley’s face is worth its weight in immunity idol gold.